New Delhi (Team Vishvas). A video of a huge stash of Indian currency notes is going viral on social media. 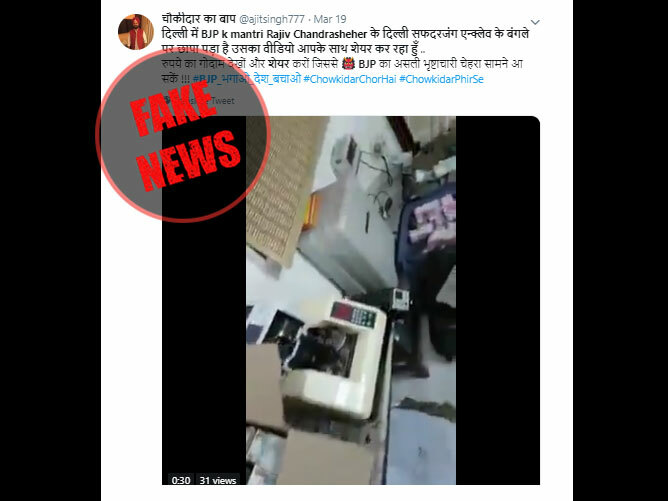 According to the message posted along with the video, it is from an Income Tax raid at BJP MP Rajeev Chandrasekhar’s bungalow in Delhi. Rajeev Chandrasekhar’s name has been misspelled as ‘Rajiv Chandrasheher’ in the viral video. In our investigation we found that the post is fake. The video is from a raid at a law firm in 2016. A huge stash of currency notes can be seen in the video. This video is 40 seconds long. 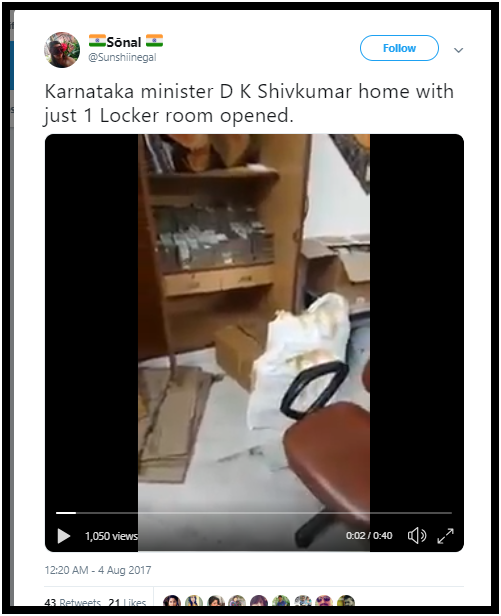 According to the message posted along with the video, it is from an Income Tax raid at BJP MP Rajeev Chandrasekhar’s bungalow in Delhi. The message urges social media users to share this video to unmask the corrupt side of BJP. Also, Rajeev Chandrasekhar’s has been misspelled as, ‘Rajiv Chandrasheher’. To start your investigation, we found this video on YouTube and put that link on the Invid tool to get thumbnails. 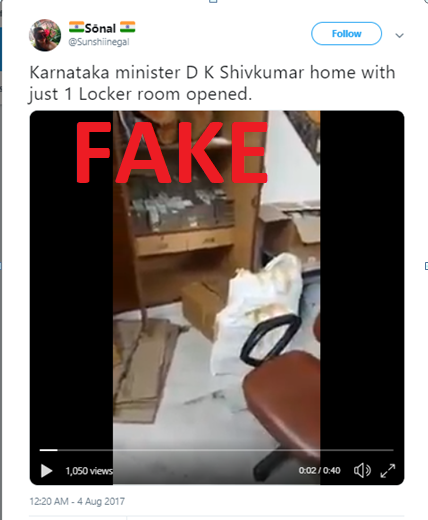 On searching these key frames on Google reverse image, we found that the same video was circulated on social media with the false claim that an IT raid was carried out on Karnataka Congress Minister DK Shivakumar’s home. For more clarity, we spoke to BJP MP Rajeev Chandrasekhar’s Political Media Manager, Pradeep Joseph, and he rejected this claim. He told us that “Rajeev Chandrasekhar’s house or office has not been raided by any agency, the viral post is wrong and is opposition’s failed attempt to assassinate Rajiv’s character”. We also talked to the Delhi Income Tax Department and we were told that IT conducted no raids at the office or residential premises of BJP MP Rajiv Chandrasekhar. Conclusion: In our investigation, we found that the viral post is wrong. We found that while the video itself is old and unrelated, the claim attached to the video is also false and malicious. 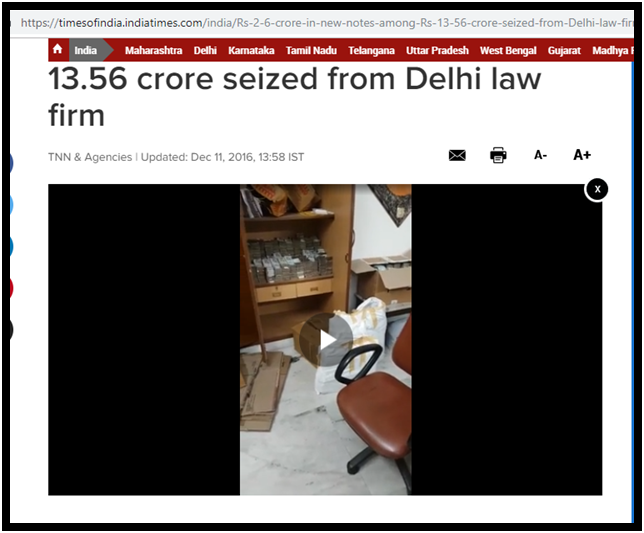 The video depicts an IT raid on Delhi based T&T law firm, owned by Rohit Tandon, in 2016. Claim Review : Huge case siezed at Income Tax raid at BJP MP Rajeev Chandrasekhar’s bungalow in Delhi.